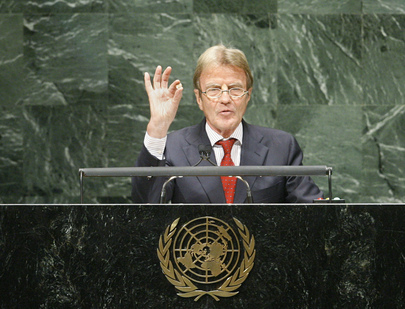 BERNARD KOUCHNER, Minister for Foreign Affairs and European Affairs of France, said his country’s goal was to be a major actor in building a global order organized and regulated around a stronger, more representative United Nations that was able to meet the century’s great challenges. For 25 years, he had walked the Organization’s corridors and, recalling the many people around the world suffering in hope, said: “We have responsibilities as citizens, diplomats and political leaders to meet their expectations.” A litany of generous intentions had been made against the very real backdrop of reduced budgets and tense socioeconomic situations, but there was indeed a way to correct the large imbalances that undermined societies. “We’re all here, the nations of the world, represented in the General Assembly and we only have to decide together to act,” he stressed. Amid such disorder, the greatest risk would be to lapse into routine, he said, but reminded delegations that the Assembly had a record of being revolutionary, and recalled its boldness in 1988 when it had adopted resolutions on humanitarian assistance. Those texts allowed, for the first time, free access of humanitarian workers to affected regions. Another resolution, adopted in 1991, had opened the door for the military to protect civilians from an oppressor State, a concept that evolved into the responsibility to protect. “Who could have imagined turning international law upside down in that way,” he asked. While the results had not been completely what had expected, obstacles had been overcome. The first shared responsibility was development, he said, noting that France’s €9 billion annual commitment to development assistance made his country among the largest providers. More must be done to help children dying of malaria and families stricken by HIV/AIDS. On the environment, emissions must be reduced, commitments implemented and effective institutions established. Moreover, tens of billions of dollars annually must be found. “The solutions are there,” he said, citing innovative financing ideas like an airline ticket tax. A mere levy of 0.005 per cent — one-one hundredth of a euro on a 1,000 euro transaction — could raise €30 to 40 billion annually, almost one quarter of official development assistance (ODA). Even half that amount could send all children to school. Such a tax would add to official development commitments, not substitute for them. As for peace and security, he discussed the Arab-Israeli conflict, saying that amid ongoing efforts, it was also important to work on the Lebanese and Syrian tracks to ensure that opportunities presented today not be lost. The best security guarantee for Israel would be a new United Nations Member State whose creation many had urged: Palestine. All regional States had a critical role to play in achieving such an end, including peace throughout the wider Middle East. Most important was that Israelis and Arabs took strategic decisions to end the conflict. “I deeply love those men and women who make the United Nations live,” he said, paying tribute to all those who took daily risks for the world’s greater peace and development. “The fight is noble.” Human rights were the bedrock on which the Organization was built. He wondered what had become of the responsibility to protect, when murders were committed in Somalia, the Democratic Republic of the Congo and in regions where peacekeeping operations had been deployed. “We can no longer just count the victims,” he said, adding that the International Criminal Court was among the greatest successes. France would always support impartial, international justice as the only way to combat impunity.